Hard red spring wheat berries have an extended shelf life. The ‘hard’ part of their name comes from the bran layer. It is truly hard and is a great barrier to oxygen. That’s really very helpful because the fatty acids in the germ of the wheat berry are easily damaged by oxygen. Oxygen begins a process of rancidity in wheat flour that is not protected from air. Wheat berries are a terrific little package of nature. The bran is the armor in protecting the nutrients on the inside; until you open the bran, by cracking, grinding, toasting or soaking, the hard shell keeps the contents of the wheat berry fresh. Wheat berries are actually the seed that has the potential to grow a wheat plant – the embryo or germ contains the genetic code and the endosperm (white flour) contains most of the energy to start the plant’s growth. This is why you can sprout wheat from your stored wheat berries. Wheat berries have been found in the Egyptian pyramids, it was part of the storage for the pharaoh’s trip to wherever he was going. The part of the story that may be a fable (in addition to the dead Pharaoh being able to eat the wheat himself) is that the wheat berries sprouted after all those thousands of years of being stored in a cool, dry environment. Well, the mummies were well preserved, so it stands to reason that the wheat berries were well preserved also. Right? It has not been verified that it is true that the berries were sprouted, which of course, would mean that the germ was still alive. But part of the fable is a good bit of advice. Store wheat berries in a cool, dry environment that is safe from insects. Insects love to eat wheat or whole wheat flour, but are not too thrilled with refined white flour. Many people have accomplished long storage life by keeping their wheat berries in dry sealed containers. Using carbon dioxide (CO2) from dry ice to replace the oxygen before closing it protects the wheat berries even more. CO2 is heavier than oxygen and goes to the bottom of the container, pushing the oxygen out the top and killing any insects in the process. With or without the CO2, store wheat berries in an airtight container in a cool, dry, dark place. If you live in a warm climate, store them in the refrigerator or freezer where they can be safely kept for years. Do not wash wheat prior to storage, as it increases the moisture content and the keeping quality. What about 55 gal. drums for storing wheat? How much dry ice does it need? What about using nitrogen? I am not an expert in the storage of wheat berries. When I have stored them, I have had them treated and packed for me. I’ve heard of different methods, but am not really aware of the best methods or the implications for the different methods. My best guess is that some of the survival food storage-type stores will give you the best advice. Be sure to remind them, if you are planning to sprout it at a future time. We inherited a large supply of 20-year stored wheat in large containers. Most of them were not airtight and some of it was loose in galvanized cans. The wheat has an old smell and I tried to sprout it with no success. Do you think it would still be good? How can I find out. I don’t want to keep it if it isn’t good. Because wheat has such a hard surface, it is probably safe to use. Since it was in cans, it probably has not been exposed to chemicals. Inspect it a bit, if you see evidence of insects, you may not be hungry enough to use it, but if you were starving, you would probably rinse it and cook it. Even if there are no insects, you may want to rinse it off and try using it, by grinding it to cracked wheat (use in tabbouleh recipes or hot cereal) or cook it whole and use as whole wheat berries (soups or salads) or grind it and use as whole wheat flour. The nutrients are under the hard bran layer and so it is still a high fiber, high nutrient ingredient. If any of the wheat has been broken to cracked wheat or flour, throw the ground or cracked wheat away; it will have become rancid and is no longer good. If you discover it is still quite delicious in cooked recipes, in addition, you may want to preserve it again (there are companies that can treat your whole grain in the cans). Or if you can’t imagine using all that wheat and don’t want to have it ‘hanging around for years’ consider giving it away. Some of your neighbors may want to store a few pounds in their freezer – no treatment necessary to keep it for more years. All wheat really needs is a dry place away from chemicals and bugs. Good health can be yummy! The bran layer of whole dry wheat berries is surprisingly sturdy. You may be pleasantly surprised to find that they will still sprout. Why not try to sprout a few in your kitchen to save yourself from the harder work of planting in the garden. If they stayed fairly dry, I think your chances are great. Any advice/experience storing boiled wheatberries refrigerated for retail? I’ve heard coating with a wheatbran oil and multivacking (removing air) helps them last for a few weeks in the fridge. I’m so sorry to be of no help with this issue; I’m completely unfamiliar with refrigerated cooked wheatberries for sale in retail stores or any store for that matter. It sounds completely plausible, however. My husband and I have been bad!! We are so excited about milling our grain and making bread that we got a little too excited. My dear husband has purchased bags and bags of wheat berries. Just the brown 25 lb. Wheat Montana bags. We have had some bags for over 8 months (or possibly longer) and have NOT stored them properly. We do have buckets with gamma lids, but we don’t have enough buckets for all the bags of wheat. Ok, my question is: do we have to throw out all the wheat berries in those Wheat Montana bags that we’ve had for a while?? I have noticed that lately my bread dough is rather wet and sticky. What should I do?? UGH!! This is not such a bad problem. DON’T THROW OUT YOUR WHEAT! If it were my wheat, the first step that I’d take is to carefully inspect the bags. Do you see any evidence of moisture or bugs on the outside of the bags? If not, Yippee! If the wheat got wet, they you will discover inside the bags that the wheat will have sprouted, or at least, popped open. If that happened you will have to throw away that popped or sprouted wheat. If you discover evidence of bugs, holes in the bags. You may have to work a little harder to try to save what you can. First, let me tell you that wheat has a nice hard covering (bran) on the outside. It will protect it from quite a bit of problems. Your buckets ‘with gamma lids’ sound perfect. Buy dry ice and then open a bag of wheat. If you have a large baking sheet with sides pour some onto it in a thin layer. Inspect the berries, if you don’t find sprouted berries, or insect droppings, then just pour the berries into your buckets. Put a piece of dry ice on the top and put the lid on loosely – this is to kill any bugs that may be hiding in the berries. Then seal the buckets and it can be kept like that for decades. If you discover, that some bugs or other damage is in your wheat, then you can sort the bad pars out and follow the steps above. You can actually wash your wheat, if there are lots of droppings, but then getting it good and dry is a challenge. If you only have a little more wheat than buckets consider storing it in the freezer or refrigerator until you can get some more buckets. Is your question of ‘wet and sticky’ bread dough related to your wheat storage problem? I don’t think it is related. If you dough is too wheat/sticky, try adding a little more flour. Thank you so much for the good advice!! I’m so glad we don’t have to throw out our wheat berries!! We will follow your instructions. 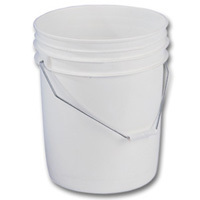 One more question, when you say “seal the buckets”, will the gamma lid be enough to “seal it”??? Maybe the weather is causing the bread dough to be a little more sticky. I was thinking that maybe there was moisture in the berries because of not being stored properly. Well, I am a “newbie” at this, as you can see!! I use a vacuum sealing machine to pack 2 lb bags of wheat berries and they have never gone rancid as there is no O2 in the bag. I have stored some for 5 years just to test. You are exactly right. Keeping the oxygen and bugs away from your wheat berries is the important thing. I don’t think it is very easy for the wheat berries to go rancid, because what does go rancid in wheat is the oil. The oil is in the germ of the berry and is protected by the very hard bran layer. So you’re onto an easy way of protecting your wheat. When vacuum packed whole wheat berries are prepared, do they need to be stored in the gamma bucket? Those buckets are very, very nice for long term storage. They’re fairly expensive, but if you’re going to store the grain for a long time it’s nice to know that air, bugs etc. can’t get into your grain. Having said that, years ago (about 1970) I stored lots of whole wheat in metal cans and used the dry ice method. I used that wheat for decades and never had a single bit of damaged or spoiled grain. If you have a small amount of grain, you can store it a dry bag or jar right on a shelf. The snag is that if bugs get into the house, the grain can be damaged. I’ve been very blessed, in that I’ve never gotten bugs in my grain. I had a friend that got bugs in her grain. She washed it in a strainer and dried it and used it. Also, an easy way of storing grain, without any fuss is to store it in the freezer, if you’re not short on freezer space. I have, for the first time, purchased a grain mill and wheat berries. I know that storing the berries in the freezer is good for long term storage. I have an empty chest freezer and will use it for my wheat berry storage. This is as far as my knowledge on storing in the freezer goes. I am unclear on the necessity of the berries being airtight if they are being stored in the freezer. Is it OK to scoop the amount of berries I need for each milling right out of the pail they are being shipped in since they will never be taken out of the freezer? Should I store the berries in individual increments in freezer bags so that they are never opened until I need to mill them? Either way, it seems the storage will not be airtight. What is best? First, I am so sorry that this response has taken so long. Apparently the automatic notice for the “Library” notes is turned off. So I only found it this morning. You’ve probably found an answer in the past week and a half, but I’ll send you one here anyway. The hard outer layer of wheat grain (berries) is very durable. Having said that, insects can be very persistent and chew through it. The wheat that you have purchased sealed in plastic pails, does not need to be stored in the freezer. It was treated before being put into the buckets to assure that there are no bugs. And the outer layer of the berry (hard bran layer) protects the oils on the inside of the berry from oxidizing (going rancid). If you open a pail periodically to scoop out berries, that’s when something could get in and do damage to your wheat berry storage. You could put it into the freezer if you want (I don’t; but live in a very arid climate, so we don’t have lots of bugs, but have enough to still be pests. 🙂 ). Kathy, think of each little grain as preserved by nature. You do need to protect it from insects, but not from cold air or natural climate. If you put a wheat berry on a hot griddle, of course, it will burst, but I’m talking just the heat of hot summer. What I would do is keep your long-term wheat berry storage in the garage or pantry, if you have room. Then if you want to keep the bucket that you’re scooping from in the freezer to protect it from insects, that’s great. As far as air getting into the pail you’re using, it’s really not much of a problem. If lots of humidity/water gets in that can, that could be a problem; but if it’s kept relatively dry, you should be fine. When you open a pail, you may choose to bag up in the batches that you will use the remaining berries from that pail. Then you don’t have to open to the air each time you want to grind wheat. Lastly, I personally would not want to pay for running a chest freezer, to keep hard wheat. It is too costly (the power that is). Of course, cooked wheat berries must be frozen if not used within about a week. If you have any other questions, please feel free to write. So sorry, again for not noticing this note. Thank you for your reply, Joyce. I was still gathering information before opening my pail to help avoid making any costly mistakes. I bought just the one pail to use right away, not to store, so that is why I was asking about what to do with the rest of the wheat after opening. We do live in a very humid climate. (YUK!) I did find a site that said one option for storage is in batches in ziplock bags, as you suggested. I already have a chest freezer (that is empty right now), so that seems the perfect solution for me. One more question. I found a debate over whether to allow the wheat berries to come to room temperature before milling or to mill straight from the freezer. That debate carried over into whether to allow leftover milled flour that has been stored in the freezer to come to room temperature first or to use straight from the freezer. What is your opinion/experience with that?